An actress from the hit television phenomenon, Doctor Who, will make a special guest appearance to kick off the biggest month in the short history of Who North America. 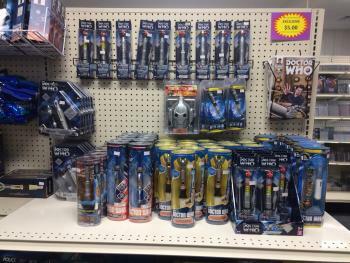 For those of you who don&apos;t know, the only Doctor Who specialty store in the U.S., and North America for that matter, is located here in Hendricks County, and there is no better time to visit than this month when two big events take center stage there. Before I get to the events, just a little history about this Hendricks County attraction. Over a year ago, Keith and Jany Bradbury opened Who North America (WHONA), 8901 S. Ind. 67, Camby, and accomplished their goal of making Doctor Who collectibles accessible and affordable to fans who live on this side of the pond. 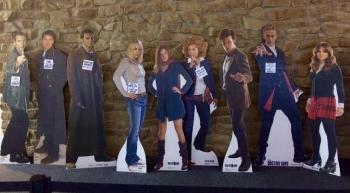 The Bradburys are avid Doctor Who fans who have turned their passion into a thriving business. It all started with $1000 and a box of collectibles...sound like an interesting story? Just ask them about it as they are forthcoming and happy to share. But enough about the store&apos;s history, let&apos;s get on to the details about these upcoming events. The first event will feature a special guest appearance by Caitlin Blackwood, who played young Amy Pond. This will mark the first time a Doctor Who character will make an appearance at WHONA! Then, later in October, the 2nd annual Doctoberfest will take place within the store and surrounding grounds. Let&apos;s get to the details! Caitlin Blackwood will arrive on Oct. 15 from 10:30 a.m.-6 p.m. As mentioned earlier, she played young Amy Pond in Doctor Who. She is Karen Gillan&apos;s (Doctor Who, Guardians of the Galaxy) cousin and appeared as the younger version of her cousin&apos;s character. Throughout the day, Caitlin will sign autographs and pose for pictures with visitors. The event is free to attend, but autographs are $20 and selfies are $10. The Bradburys gave me a sneak preview of the guest appearance. 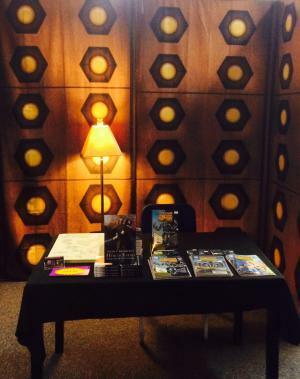 Caitlin&apos;s desk already is set up in the Doctor Who Merchandise Museum. The back drop resembles the inside of TARDIS. Appearing as though you are traveling in a TARDIS definitely provides for a unique selfie. Caitlin&apos;s break times are 12:30-1:15 p.m. and 3:30-4 p.m. Her breaks will provide visitors a great opportunity to meet the Bradburys and peruse the retail side of the WHONA, which is considered a whotopia to Whovians! Be sure to check out to this unique first-time event! Who North America&apos;s biggest event every year returns Oct. 28. Celebrate all things Doctor Who at Doctoberfest from 11 a.m. to 6 p.m.
Get into the spirit of Doctorberfest and dress as your favorite Doctor Who character! The best look-a-like will be chosen by festival attendees. Then, Alena Van Arendonk will pick the best cosplay outfit. Pick up a registration form at WHONA, call (317) 481-8189 to have it emailed to you or contact them through their website. You must enter by Oct. 26, and the registration fee for each entry is $2. You can find contest rules on the registration form. Show off your pumpkin-carving skills at this unique competition. Last year&apos;s winner carved a Dalek. Pick up a registration form at WHONA, call (317) 481-8189 to have it emailed to you or contact them through their website. Cost is $2 per pumpkin to enter with no limit on the number of pumpkin entries. You can learn more about contest rules on the registration form. The Bradburys handpicked 12 vendors for Doctoberfest. All sell handmade Doctor Who items, such as baby merchandise, ornaments and trinkets. Vendors will set up outdoors. Show off your skills and win prizes by purchasing tokens, playing some unique Doctor Who-themed games and winning tickets. Games will be located outside near the vendor area. Chick-fil-A and Domino&apos;s Pizza will provide food that can be purchased throughout the day. As previously mentioned, the retail area is a whotopia for Doctor Who fandom. 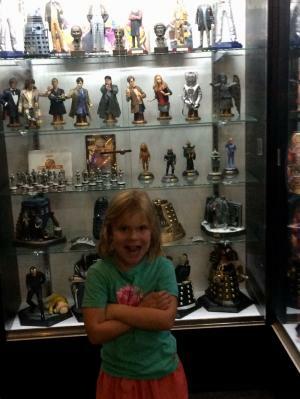 This one-stop spot for Doctor Who merchandise can be a bit overwhelming at first because of its magnitude. The Bradbury&apos;s dedication to offering top-notch Doctor Who toys, books, comics, CDs, DVDs, collectibles, housewares and much more is obvious. My daughter and I debated between the TARDIS cookie jar, Sonic screwdrivers and the TARDIS talking trash can. We settled on the cookie jar. Be sure to check out this amazing space during Doctoberfest! 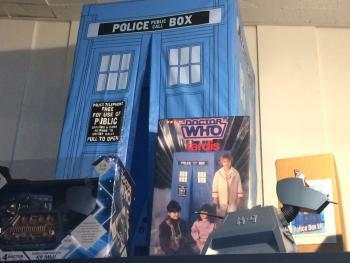 Any Doctor Who fan will marvel at this collection of Doctor Who memorabilia from the 1960s to today. Some of my favorites include walkie-talkies, a chess set and a TARDIS play set. It provides a one-of-a-kind viewing experience for many visitors as much of the merchandise was never sold in the U.S.
One quick detail regarding parking...you will be directed where to park in the surrounding areas. A shuttle will be available for driving attendees to WHONA, and a small fee is required. Even if you cannot attend these events, be sure to visit WHONA. Store hours are Tuesdays-Thursdays from 11 a.m.-6 p.m. and Fridays and Saturdays from 11 a.m.-8 p.m.
You can also check out their website to view retail offerings.